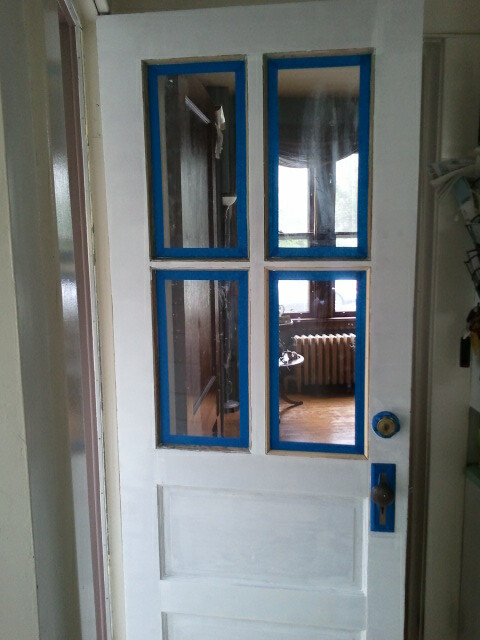 So we decided to paint the door while on the hinges. I know, I know, not best practice...but it was a rainy day and I just wanted this thing done! So we got it all taped up. One note here - the more I use painter's tape, the more I realize I'm doing something wrong, or it's just not what it's cracked up to be. 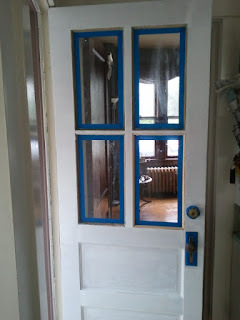 Every time I've ever used it, it pulled paint off the project (in this case the door) and I had to do some touch-up work. 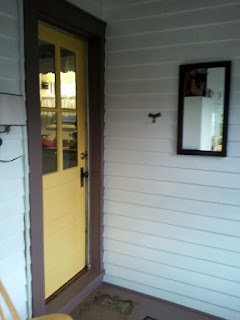 Last winter I was cruising through some blogs and came across The Yellow Front Door. I really liked her idea of getting people to paint their doors yellow (I only wish she was still blogging), and like I said in a previous post, I had this yellow paint that I loved. It's "Goldenrod" by Valspar. On the computer it looks awfully bright, but in real life it's a rich, creamy yellow. As I've noted before, I've used Baehr paint from Home Depot on a couple occasions and was less than thrilled. 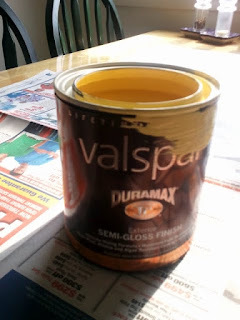 So this time I gave Valspar a try. I really did like the way it covered, it's going to (obviously) take some time to find out about its durability. So here it is! 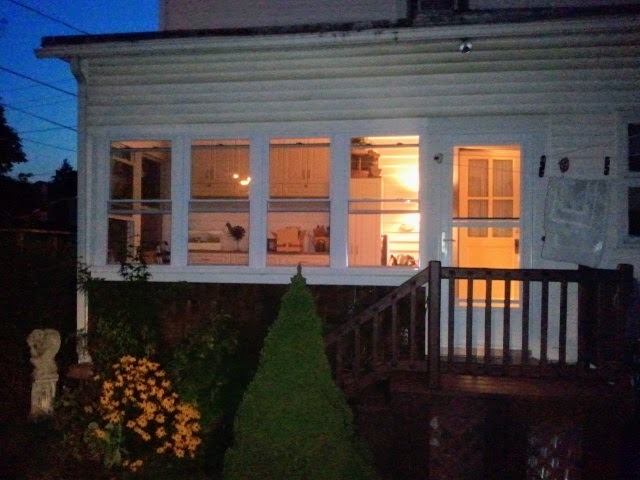 I'm posting a couple different angles because it's hard to get a full-on shot from inside the porch. 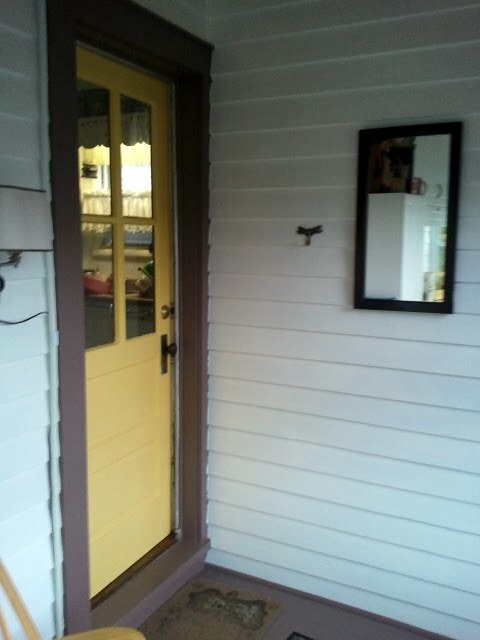 I love how it instantly added some color to the porch (of course, what would I expect from a yellow door - right?)! Like I said, I'm considering one more thing for the door. If it happens, you'll see yet another door posting...we'll see. AFTERNOTE: This is fun! 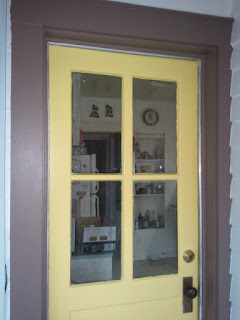 One of the blogs I follow, Young House Love, just posted about painting their door - yellow! Now, our house is nothing like theirs, but I've gotten some great ideas, motivation and inspiration from their blog...now we have similar doors! We even used the same paint (albeit a different shade of yellow)! Anyway, because of the similarities of our posts and the great stuff in their blog, I wanted to pass the information along! See their door here. Thanks a million! We did a lot of work on the back porch, then noticed that we really needed to add some color! What better than yellow to cheer a place up?